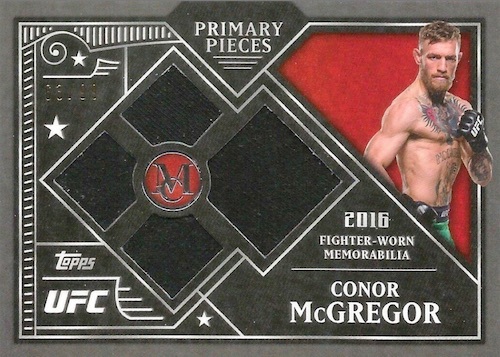 While Museum Collection inserts have been included in past Knockout releases, 2016 Topps UFC Museum Collection marks the standalone debut of the high-end brand for Ultimate Fighting Championship collectors. Hobby boxes are led by one on-card autograph, one autograph relic and one relic card. 2016 Topps UFC Museum Collection offers a 45-card base set that features the top names of MMA. Limited parallels include Copper (#'d), Gold (#/75), Sapphire (#/50), Ruby (#/25), and Emerald (1/1). 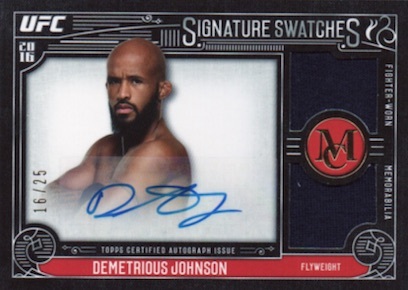 Promising one hard-signed card in each 2016 Topps UFC Museum Collection box, on-card options include Archival Autographs (#'d) for vets, former fighters and young talents. Low-numbered parallels add to that with Gold (#/25), Ruby (#/5), and Emerald (1/1). 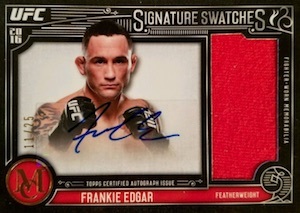 Dual Autographs (#/10) pair two fighters on the same card with on-card signatures. One of the standouts of the brand, Museum Collection Framed Autographs have the ornate design and quality of a work of art with a metal frame and on-card autographs. Versions include Gold Frame (#/15), Silver Frame (#/5) and Black Frame (1/1). Also falling one per box are the auto relics. 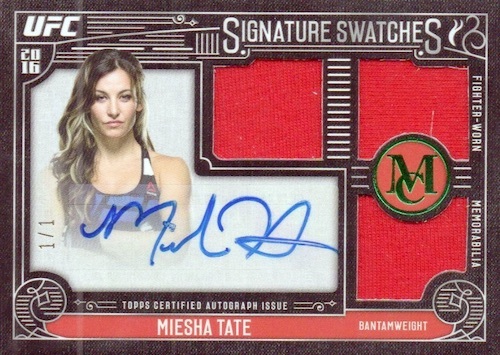 2016 Topps UFC Museum Collection features Single-Fighter Signature Swatches Relic Autographs (20 cards - #'d) in Dual (15 cards - #'d) and Triple (15 cards - #'d) memorabilia versions in addition to the one-piece edition. There are also Gold (#/25) and Emerald (1/1) parallels for each insert. Closing out the main hits, standard relics are another box hit in 2016 Topps UFC Museum Collection. Showcasing four relic pieces per card, Single-Fighter Primary Pieces Quad Relics (30 cards - #'d) and Quad Relics Legends (15 cards - #'d) work with fighter-worn or event-worn gear. 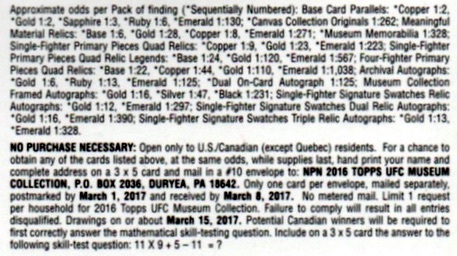 Parallels include Copper (#/25), Gold (#/10) and Emerald (1/1) for the main version and Gold #/5 and Emerald (1/1) for the Legends. Four-Fighter Primary Pieces Quad Relics (10 cards - #'d) put memorabilia pieces for four different subjects on the same card with Copper (#/25), Gold (#/10) and Emerald (1/1) parallels. Lastly, Canvas Collection Originals (1/1) display authentic artwork of key MMA names. 2016 Topps UFC Museum Jessica Aguilar (RUBY RED) (ON CARD AUTO)! 3 CARD LOT!!! 2016 Topps UFC Museum Jessica Aguilar (#5 10) (RUBY RED) ON CARD AUTO!!! RARE! PARALLEL CARDS: Copper #/135, Gold #/75, Sapphire #/50, Ruby #/25, Emerald 1/1. PARALLEL CARDS: Gold #/25, Ruby #/10, Emerald 1/1. 24 cards. Serial Numbered #/50. PARALLEL CARDS: Gold #/35, Copper #/10, Emerald 1/1. 28 cards. Serial Numbered #/99. 11 cards. Serial Numbered #/25. 6 cards. Serial Numbered #/50. Good: All hits are serial numbered, Archival Autographs are on-card, cards have a quality look and feel, framed autographs continue to be a standout insert. Bad: Doesn’t have the same freshness as other debut releases, base card stock a tad thinner than expected, would be nice if Signature Swatches made move to hard-signed. 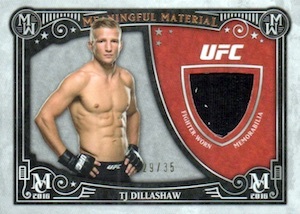 The Bottom Line: A new release without really feeling or looking new, 2016 Topps UFC Museum Collection operates under a solid formula that allows it to establish a good foundation as a standalone brand. While the pricing and output for an eight-card box will always be measured directly against what you do or don’t hit, the overall quality in each box is largely satisfying enough. Borrowing heavily from 2016 Museum Collection Baseball, nothing I pulled really stood out against the MLB release from a design perspective other than featuring UFC fighters. And this is not necessarily a bad thing as the cards look impressive in hand. The Archival Autographs insert in particular caught my eye with the massive signing area that allowed Joanna Jedrzejczyk to add her full signature. I did immediately notice the lesser base stock but I assume this was a cost-cutting measure and many would prefer it come from the base cards than elsewhere. Most of the other things I noticed were little issues like the Signature Swatches cards with dual relics of the same look and feel. It would be nice if instances like this made an effort to have different swatches but I realize there is more a limitation compared to other sports. The three different versions of Signature Swatches, with many overlapping subjects, also felt a bit redundant. With the UFC releases, you are always going to get a smaller checklist to work with. While that does mean that many releases seem to feature the same names, over and over, it does limit the risk to an extent. Most of the signed sets have a tighter group of subjects other than the Archival Autographs. The tradeoff here is the on-card autographs. Around $80 per box at the time of this review, the value is no home run but it seems more fairly priced, especially when you consider what the MLB version runs. The main part of the value that is helpful across the release deals with a box format which yields one on-card autograph and one autographed relic in every box. Of course, the big hits like the framed autographs are lurking, as are the signed options for Rousey and McGregor. This also helps value. While the price is still a bit too high in my opinion, the fun was right on point. Good designs, an on-card signature in every box and three total hits, each numbered (#/99 or less in my box), is a winning formula. Like all the one-pack releases, the fun is over quickly but 2016 Topps UFC Museum Collection did not leave me with a sense of disappointment when it was all said and done. 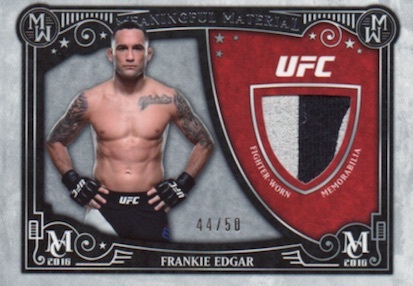 Shop for 2016 Topps UFC Museum Collection boxes on eBay. 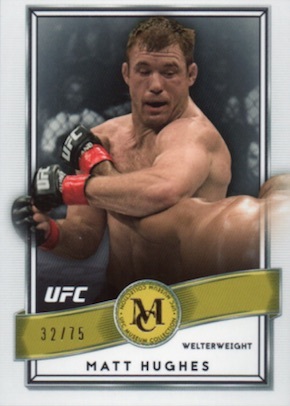 This is the best UFC product that Topps has put out this year… You can take it as you may, but that isn’t really high praise since the other releases up to this point set the bar really low. 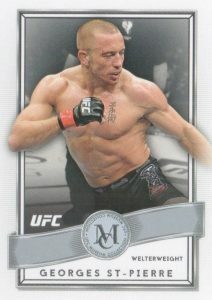 FINALLY there has been a hard signed cards sighting in a UFC product. 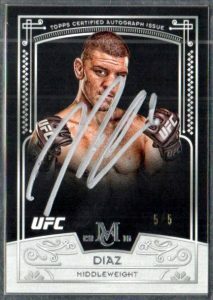 The plethora of hard signed cards in UFC products alone made the products attractive to collect. There were no duds in the auto checklists like champions or knockout. The relic/auto cards are some of the better ones produced for 2016. 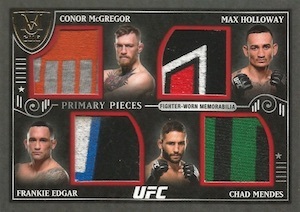 The problem with UFC relics are that they are just fighter worn and not fight used so a t-shirt relic just does not equate to a jersey relic on other sports. I’d like to suggest to Topps to start collecting fight used or event used gear and use them in the product. The basecards are rubbish. I would’ve rather seen unframed versions of the auto cards as the base as they have done in past products. Not bad but not great. Still better than 2016 knockout..
Best Topps has released this year. Cards are sharp cut clean and relics well placed. The metal frames are even better made then previous versions. I’m hooked !! 2016 Topps UFC Museum Collection Box Factory Sealed Hobby NEW!